DRIVING DIRECTIONS to Penny’s Bend from I-85: take Exit 177, Roxboro Street. Head north on Roxboro Street toward the gas stations and fast food restaurants. In 1.5 miles, turn right onto Old Oxford Road. Stay straight and in 3.2 miles, you will cross the Eno River. Take a quick left onto Snow Hill Road and immediately look for the Penny’s Bend gravel parking lot on your left. Park here to access the trails. The physical address is 3710 Snow Hill Road, Durham NC 27712. HIKING DIRECTIONS to Penny’s Bend: Access the trails at the edge of the field in the northwest corner of the parking area. The path follows along the field before crossing a wooden footbridge and turning left into the woods. This is the Riverbend Trail (intermittently blazed with white dots), which follows the Eno, upriver. Stay straight on this trail for approximately one mile. Begin to look for a trail branching off on the right. Turn right onto the Ridge Trail (there are no signs or blazes). The trail quickly winds uphill to a big field before straightening out. You’ll know you are on the right trail when you reach the top of the hill and see a large, flat boulder up ahead. Look for a single tree just off the right side of the trail before you reach the rock—this is where the main photo in this month’s calendar spread was taken. Continue straight on the Ridge Trail as it gradually heads downhill. Do not turn off this trail. You will see an old, rusty trailer appear on the left. Just past the trailer, there will be a narrow trail to your right; take this trail. You will pass a large, dead tree on your left as you make the turn. As you head down the trail toward the river, the caretaker’s cottage and outbuildings will come into view at the top of the hill on your left. Once you reach the river, turn left onto the Riverbend Trail. Shortly, you will be back at the wooden footbridge and then the parking area. This round-trip hike is just over 2 miles. Penny’s Bend Nature Preserve is a quiet 84-acre property in Durham County managed by the North Carolina Botanical Garden. It is actually owned by the U.S. Army Corps of Engineers and sub-leased by the N.C. Division of Water Resources. Please checkout the links below to familiarize yourself with the uniqueness of this natural area. We hope you enjoy the seclusion of Penny’s Bend! The photos below are of two rare plant species in bloom at Penny’s Bend. 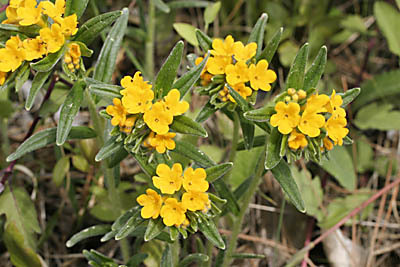 The bright yellow-orange flowered plant (photo on the left by Kurt Schlimme) is hoary puccoon, a threatened species found in only two counties in North Carolina. 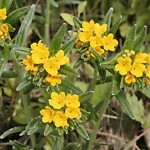 You can read more about its successful response to prescribed fire in this post: http://bwwellsassociation.wordpress.com/2013/09/20/prescribed-burns-aid-the-hoary-puccoon-lithospermum-canescens/. 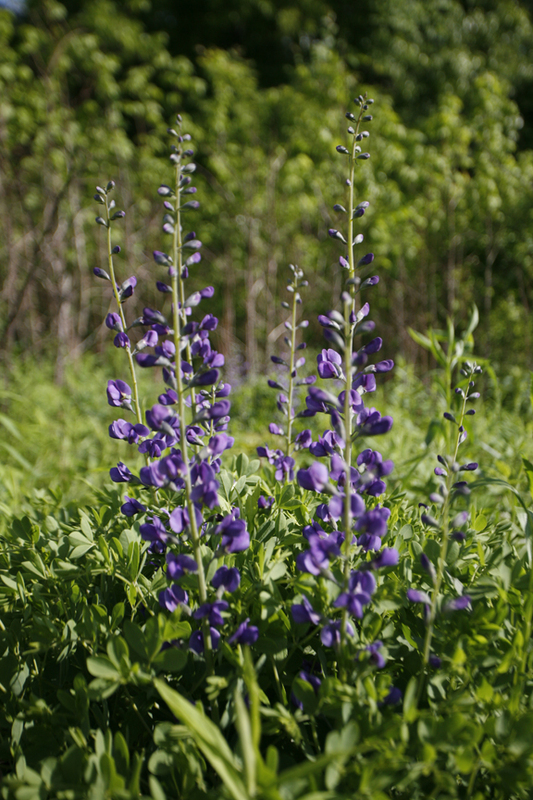 The dark blue flowered plant (photo on the right by Joe Liles) is wild blue indigo, a rare plant in these parts. Both these beautiful wildflowers can be seen in bloom beginning in late April, early May through the end of spring.